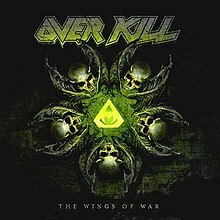 Since 2010’s ‘Ironbound’ album, Overkill have been in somewhat a purple patch and their latest album ‘The Wings of War’ is certainly craft from this mould. Whereas their previous album ‘The Grinding Wheel’ may have taken a few listens to get used to, ‘The Wings…’ is instantly enjoyable and this is partly down to an increase in aggression from Overkill with a sound that has more akin to ‘White Devil Armory’ than the previous album. This is seen in tracks such as ‘Believe in the Fight’, ‘Last Man Standing’ and ‘Distortion’ which show that Overkill have lost none of their bite or prowess. Furthermore, Overkill continue to add a little tongue in cheek humour into their music with an ode to their home in ‘Welcome to The Garden State’, a song where Overkill blend their aggressive thrash seamlessly with the ‘whoa whoa whoa’s’ of Bruce Springsteen’s ‘Born to Run’. The song writing for this album is superb, it is classic Overkill that will the listener baying for more; yes, the band stay very much within their remit, but why change the formula that works especially with an album so enjoyable. With so much focus on the American ‘Big 4’, Overkill are very often overlooked, but the New Jersey thrashers have once again released some top-drawer metal which already sets the bar high for their peers in 2019 and it will not be surprising to see this album sitting high at the end of the year.